The more tangled you get, the better you'll do in Entanglement. I neglected to stay on topic with this particular submission. The original topic two weeks ago was "trap" which produced my initial idea to do this. Our last topic was "bait", but I continued working on this and couldn't find a good way to get it to work with the new topic, so I didn't. I suppose Todd will beat me on this round. Bug: sometimes spare tile obstructs the corner of the board. You might want to make the game zoom out a bit further on this situation. Thanks Tautrimus! Several folks have mentioned that being an issue. I'll try to fix it on the next update. Whoops, thanks afe-coda. It should work correctly now; you may need to refresh the page. I would love to see a move undo function for those times when I place a tile accidentally as my eyes fail to work because of all those crossing lines! can someone give me tips on how to play this game ps? ok...i think am getting it now lol...gradually though,..today is my 1st day here. just wanted to know if this uses HTML 5. This is a nice cool game! how do I score beyond 102!!!!. people are scoring 2500!!! howwwwwwwwwwwwwwwwwwwww? Is entanglement available for Nokia E71 or Android phones? @Mihirr: you need to make the snake as long as possible rather than lots of small snakes. 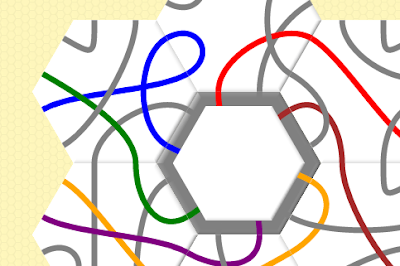 I try to weave a route around the middle ring of hexagonals (so not too close to the edge or the center) and get easily over 300 points. How to get over 1000 is a mystery to me, but I keep trying! It is very addictive and there is much more to it than meets the eye. 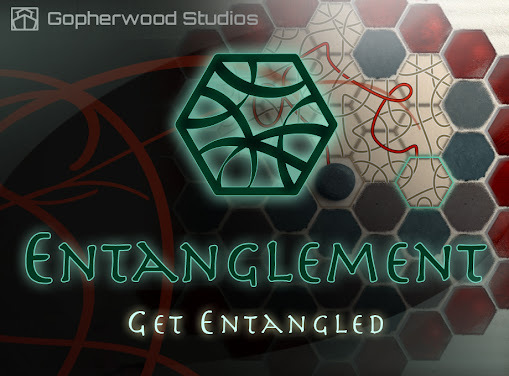 I agree, i would like an Undo move, entanglement is a great game! I love games that are so simple to learn, yet so complex to master! I would also add to the chorus of those requesting an Undo function. It's disheartening (esp. for those of us who already need glasses) to see a potentially great game shortened due to a misread path. If you guys think that's against the spirit of the game, then I'd at least ask for an option to turn on a "This move will end your game! Are you sure you want to do this?" Pretty please! This game is wonderful. Thanks very much. - It would be helpful to have color-coding for paths to make it easier to visualize dead vs. alive paths. Either automatic, or allow me to right click a path and give it a color. - The undo thing, well, I think using undo should mean that your score doesn't count, but, it would sure be helpful for times when you bump the spacebar or something but want to see how something would have turned out, or learning, even if the score didn't count. This is probably the best solitaire board game I've seen online ever. The design is great, the mechanics is smart (did you invent it or is it an adaptation of an oriental game?). I do miss a port on Android now. If you love Google so much, why stick to iOS? Pleease! I agree this is one of the best solitaire games ever. The only unpleasant aspect is continually trying to trace all those threads. It would be brilliant if the thread paths were multi-coloured, or if you could 'mouse over' any thread to highlight its path! Well... everybody wants an "Undo" button. I can only say "Me too!" Haven't played for a few years (no 'puter) and now find the game has changed and has only one alternative tile instead of 4 options and I've also 'swapped' the opening tile, only to be sent straight to the 'outer limits'. Is there a prize for lowest score (i.e. 2)? I would also love an 'undo' button - pleeease!